Horemheb’s tomb at Saqqara was constructed when its owner was Generalissimo of the Egyptian armies under King Tutankhamun (1333-1323 B.C.). This means he must have been responsible for the foreign affairs of the boy-king, who died childless around the age of 18. Horemheb seems to have missed the opportunity to grasp the power then. He succeeded, however, four years later after the death of Tutankhamun’s successor, Ay. 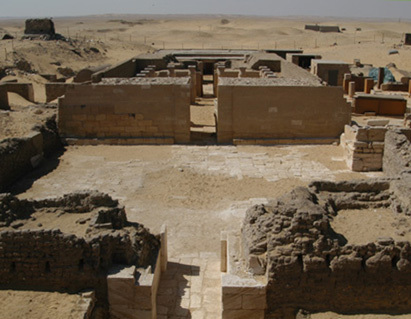 As Pharaoh, Horemheb started the construction of a new tomb in the Theban Valley of the Kings. 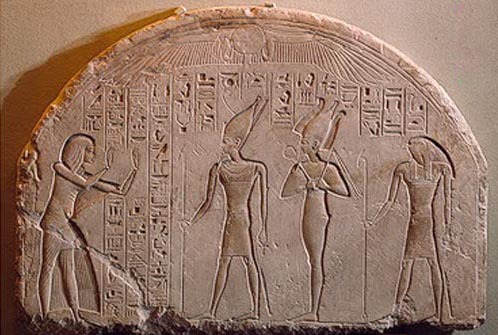 His old tomb at Saqqara was used for the burial of his queen, Mutnodjmet. It was discovered by art robbers at the beginning of the 19th century. 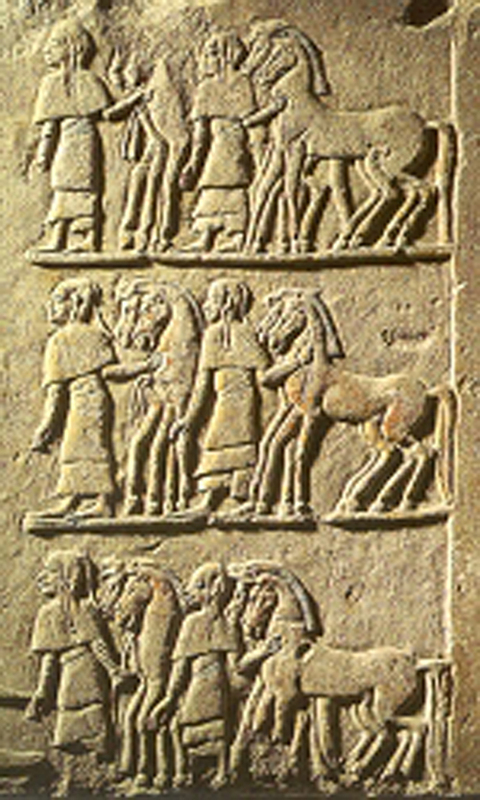 Various reliefs were sold to a number of European and American museums, including the RMO in Leiden. The tomb was then relocated by the Anglo-Dutch mission in 1975 and the excavations lasted until 1979. They were resumed in 1999-2000 with an inspection of the south exterior wall and its foundations, and in 2004-2006 when the expedition uncovered the forecourt and First Pylon of the tomb. The superstructure is about 65 m long and 20 m wide. It is built along an east-west axis and consists of a first pylon, forecourt, second pylon, outer courtyard, statue room flanked by two storerooms, inner courtyard, and three offering-chapels (the central one originally with a small pyramid on the roof). The walls are built in mudbrick. The inner wall-faces had limestone revetment with beautiful reliefs, except for the statue room, storerooms and lateral chapels which had painted scenes on mud plaster and barrel-vaults. The courtyards have peristyles of papyrus bundle columns. Extensive remains of the wall-reliefs have been preserved, especially in the entrance to the statue room and all around the second courtyard. The latter represent Horemheb being rewarded by Tutankhamun with the gold of honour (part of this scene is now in Leiden), rows of prisoners, scenes from the army camp, and funerary rites. A subterranean complex opens in the floor of the inner courtyard. This comprises a 10.25 m deep shaft leading (via a second pit and corridor) to a decorated tomb-chamber for Horemheb’s first wife. A side passage gives access to another succession of vestibules and stairs, ending with a pillared hall (depth 21.09 m). This in its turn contains another shaft of 7 m depth, leading to an unfinished tomb-chamber. A female skeleton and the bones of a foetus found on the edge of the latter shaft have been identified as the remains of Mutnodjmet and her still-born child. The whole complex contained numerous fragments of the original burial gifts, including several objects with royal names. Parts of the tomb were later used for Late Period burials or as hermitages for monks of the nearby Monastery of Apa Jeremias. 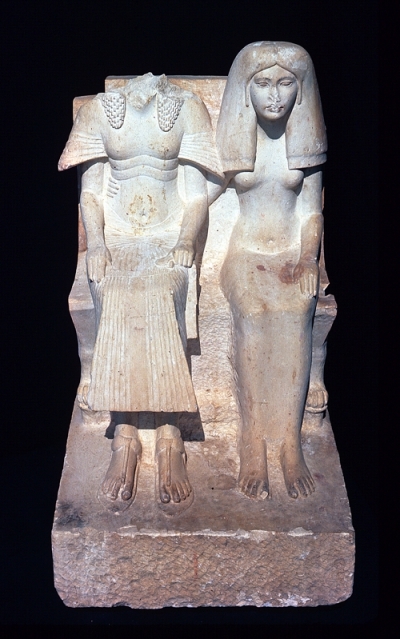 This dyad represents Horemheb and a woman, presumably his first wife Amenia. It was found overturned at a high level in the debris of the central offering chapel, but there is no evidence to prove that this chapel was its original provenance. The head and part of the shoulders of the male person are broken off and lost. He is represented wearing a duplex wig and a tunic with pleated sash-kilt. There is a folded piece of cloth in his left hand and there are sandals at his feet. The woman curves her right arm around her husband’s waist. She wears a plain wig and a close-fitting dress which are clearly unfinished; a lotus flower is just visible in shallow carving above the forehead. The statue is uninscribed. 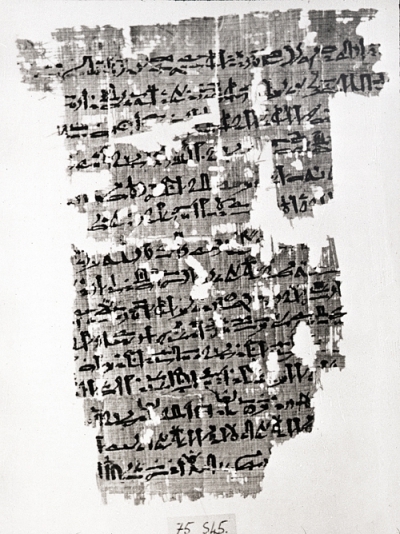 In spite of the fact that is was much damaged by art robbers since it was found, it is now displayed in the Luxor Museum. calligraphic work of an experienced scribe. This rare item of jewellery was found in 1977 in a chamber of a shaft in Horemheb’s outer courtyard. The earring is made of solid gold. Its central element depicts a Pharaoh in the shape of a sphinx wearing the blue crown with uraeus, royal beard, and broad collar. 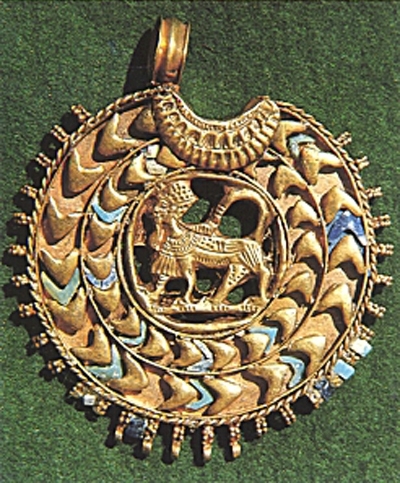 It is surrounded by two ranges of gold chevrons, with coloured pieces made of deep blue and turquoise glass in between. The exterior edge is worked in twisted wire and granulated loops, originally with glass beads in between, and with five pendants dangling from the lower edge. The upper edge still has one of the loops of the suspension device. The earring, fortunately overlooked by robbers, can be dated to the reigns of Tutankhamun or Horemheb. It is now on display in the jewellery room of the Egyptian Museum in Cairo. Martin, G.T., The Memphite Tomb of Horemheb, Commander-in-Chief of Tut’ankhamûn, I (London, 1989). Schneider, H.D., The Memphite Tomb of Horemheb, Commander-in-Chief of Tut’ankhamûn, II: a Catalogue of the Finds (Leiden and London, 1996). Bourriau, J.D., D.A. Aston, M.J. Raven and R. van Walsem, The Memphite Tomb of Horemheb, Commander-in-Chief of Tut’ankhamûn, III: the Pottery (London, 2005). Strouhal, E., The Memphite Tomb of Horemheb, Commander-in-Chief of Tut’ankhamûn, IV: Human Skeletal Remains (London, 2008). Raven, M.J., V. Verschoor, M. Vugts and R. van Walsem, The Memphite Tomb of Horemheb, Commander-in-Chief of Tutankhamun, V: The Forecourt and the Area South of the Tomb, with Some Notes on the Tomb of Tia (Turnhout, 2011).